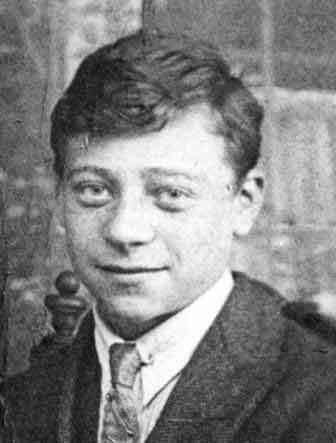 He was born on 2nd April 1887 at 62 Norman Street, Derby, the oldest son of Isaac and Kate (née Newland). When he died, aged 61, in the City Hospital, Derby, on 14th January 1949, I was only 19 months old, but I like to think he had time to meet his grandson before he passed on. As his birth certificate (left) shows, at the time of grandad's birth Isaac was employed as a foundry worker - an occupation that was to persist for the next three generations of the Conway family. Later they were to have 9 more children: Rebecca (1889), Florence (1890), Sarah (1892), Rose (1893), Lily (1895), Edward (1901), Annie (1903) Rose (1903) and Violet (1910). By 1901, according to the Census (below), 14 year old Ernest John was living with his parents, brothers and sisters at 22 John Street, Derby. 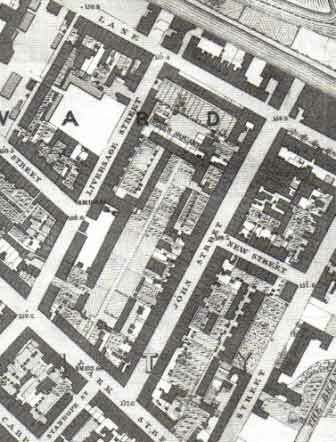 His father, Isaac, was employed as a "Striker", possibly at the Engineering Works at the end of the street, next to the Derby Canal, but more importantly very near the Railway Works. Ernest and Emma's Marriage Certificate (right) would, however, seem to support the 3:9 split of full time to reserve service, rather than the more normal 7:5 ratio. When they married on 4th July 1908, grandad's occupation is stated as "labourer", not soldier as would be the case if he was serving his 7 years on active duty. 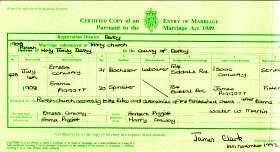 Also, eldest son, Albert, was born in Derby, in 1910 - not, as might be expected, in India which would have been the case if Grandad was serving a 7:5 service. 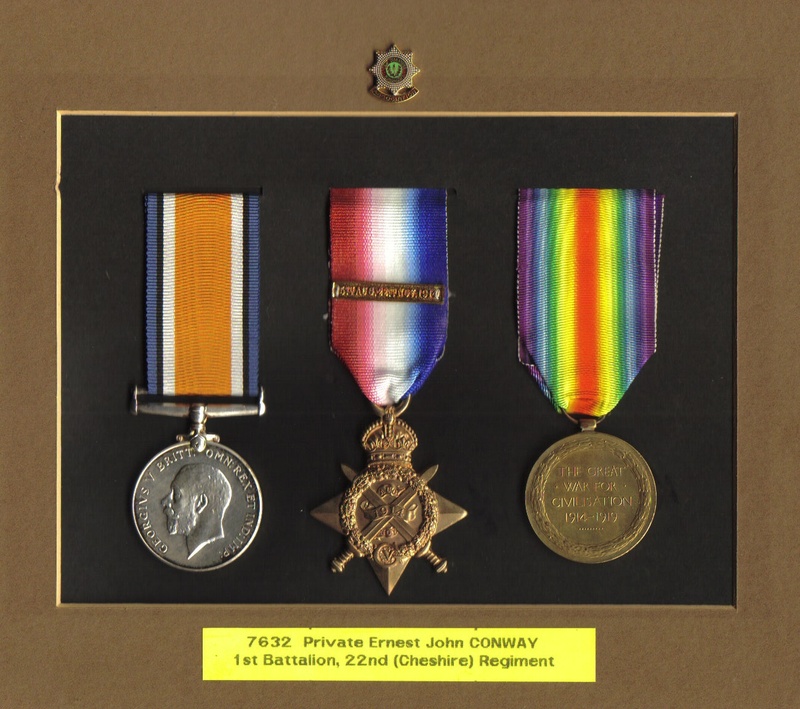 This site seeks to describe the Army service of Private 7632 Ernest John Conway, until the time of his final discharge from the Army in 1916. The menu bar will take you to the different periods of his Army career, particularly the two great battles he was involved in, at Audregnies and Voilaines (where he nearly lost his life). 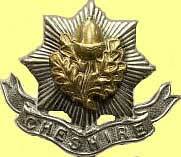 Alternatively, you can explore the First Battalion's War Diary and link to dedicated Cheshire Regiment pages where the Officers, NCOs and men who gave lives during the first five months of The Great War are commemorated. Wherever possible I have visited each Grave and Memorial where these brave men and comrades of my Grandad now lie. You can see photos of their burial or commemorative site and read a little about their lives, so suddenly brought to a close. 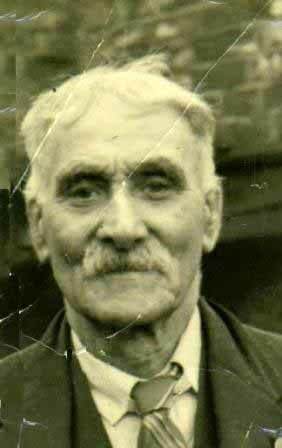 At the time of my grandad's birth his father, Isaac, was 19 years old, having been born on a barge at the Lion Wharf, The Hill, Halesowen, Worcestershire, on 12th September 1867. 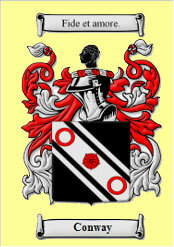 Isaac was the oldest of six children born to Edward and Sarah (née Smith). The couple had probably inherited the barge from Sarah's father, himself a boatman. Just three years later, however. 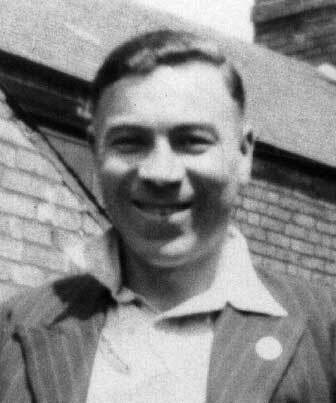 Ernest John's life was to change dramatically. 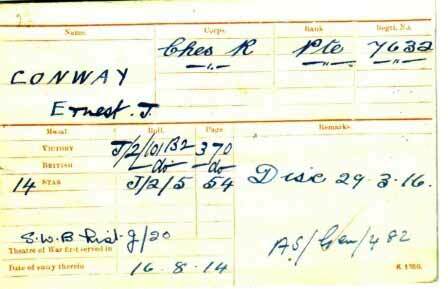 There is evidence from his papers that he was already enlisted with the Volunteer Battalion of the Notts and Derbyshire Regiment (The Sherwood Foresters). 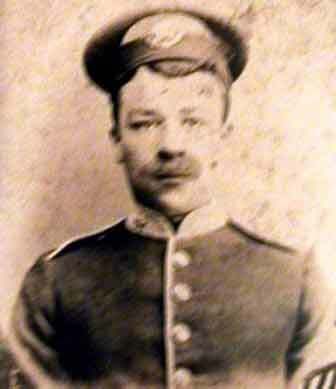 I knew little about Grandad's Great War service until about 10 years ago. My dad had told me he had been in the Cheshire Regiment and also he had ".. been on the first boat out and the first boat back!.." This I learned from a yellowing newspaper cutting (below), found among my dad's photos, was because he had been wounded at La Bassée. After some searching at the Derby Local Studies Library, I found that the cutting had been originally printed in the "Derby Daily Express" on Friday, 23 October 1914. So maybe it was not quite the "first boat back", but it was certainly not long into the War. Also in the house, which I used to play with as a child, were Grandad's medals. These were kept in an old tin box. Of course, later I realised the significance of my childhood playthings. 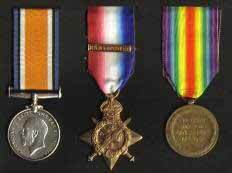 Grandad's medals were "Pip, Squeak and Wilfred" or, more properly, the 1914 Star (popularly known as the "Mons Star"), with its bar to show he served under fire; the British War Medal and the Victory Medal. The old box was Princess Mary's Gift to the troops, Christmas 1914 and even though Grandad was back in Britain by then, he would have qualified to receive his gift as a "Class C: all troops in the British Isles" recipient. Click on image to read more about the gift. In total the three surviving brothers, who all spent their working lives in heavy industry and grew up in virtual poverty, amassed a total of 265 years of life! Grandad's medals carried the a bar inscribed "5 Aug. to 22 Nov. 1914" which was awarded to all those who served under fire with the original British Expeditionary Force. To distinguish between the holders of the '1914 Star' and the later '1914-15 Star', which has the same ribbon, holders of the earlier award were permitted to wear a small silver rosette on their ribbon when the decoration itself is not worn (as shown on Medal Bar - above). For this reason the 1914 Star is often shown awarded "With Clasp and Roses". Grandad's 'Medal Card' (right) shows that he was entitled to the three medals shown and that he entered France on 16th August 1914. 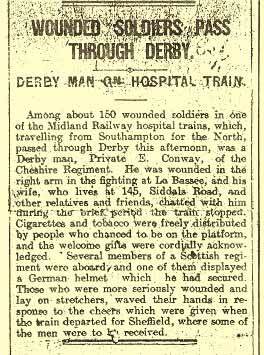 He was discharged from the Army, presumably due to wounds received, on 29th March 1916. By the time of the 1911 Census,Grandad and Grandma, with their new-born son, Albert, are found living at 145 Siddalls Road, Derby - with the in-laws! The house is the home of James Piggott, Emma's father, and although the Census return states the house had 6 rooms, Siddalls Road was not reknowned for having large houses! In addition to the Conway family, James and Mary Piggott still had 6 children of their own living at home. 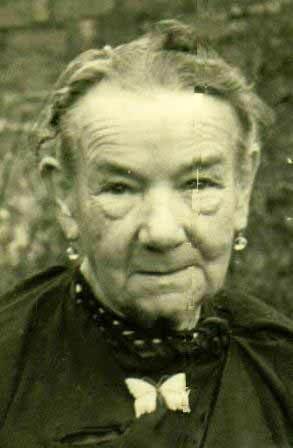 Kate, who Isaac married on 19 September 1886, was born on 4th January 1866, at sea, aboard the S.S. Tyburnia. 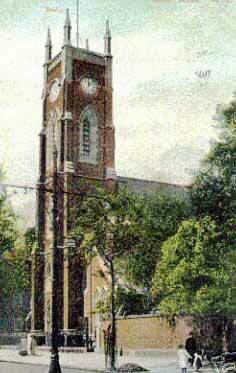 Her father, John, was in the the 56th Regiment of Foot and he and his wife. Mary Ann, were in transit from Poona, India, to Portsmouth. In addition to his Medals Grandad also received the "Silver War Badge" (left) (sometimes mistakenly called the Silver Wound Badge). His Medal Card (bottom left) notes that he was on roll reference "J.20". 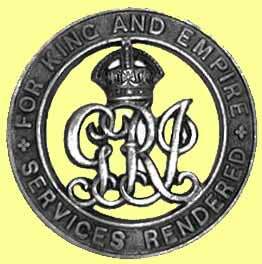 The badge was awarded to all of those military personnel who were discharged as a result of sickness or wounds contracted or received during the war. ... and watch the first live performance of a song about Grandad Conway, written by Scott Allsop and performed by "One for the Road". 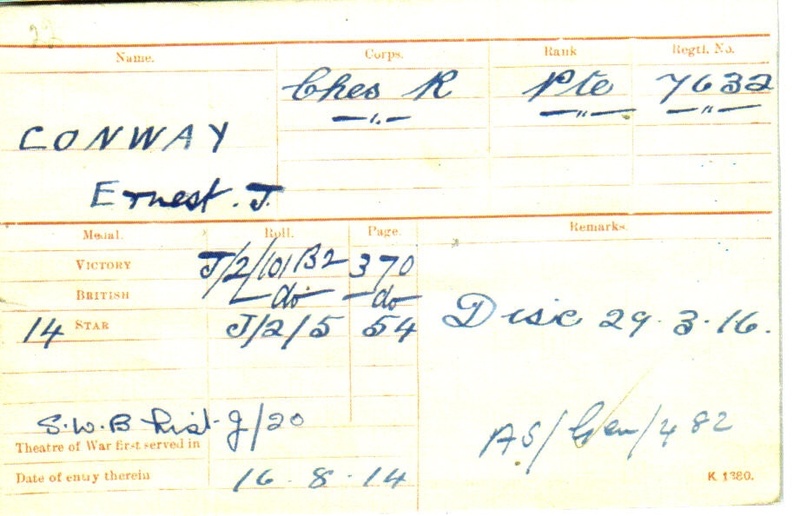 From the few surviving fragments of Grandad's Service Papers, it appears that in 1915 there may have been the possibility of him returning to join his Battalion in France, but he was admitted to Chester Military Hospital on 11th February, suffering from "Dyspepsia", where he remained for 10 days. On the opposite page the doctor (H. L. Donovan [?]) appears to have written: "Excused from France an account of stomach trouble. Bismuth Diet prescribed". Whilst in modern day terms this seems rather a small matter, it was clearly deemed sufficient not to send him back to France - a decision I, for one, and my late dad for another, are most grateful.